appearing on stage around the world. We live in a period of time in which change is happening faster than ever before. Success will come to those who innovate, change and adapt! The Future Belongs to Those Who are Fast features the best of the insight from Jim Carroll’s blog, in which he covers issues related to creativity, innovation and future trends. 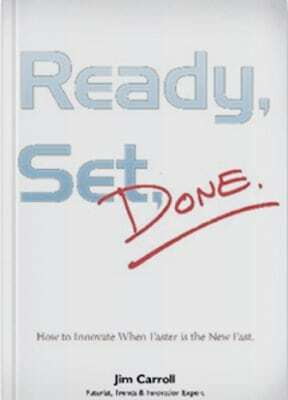 Notes Jim in the introduction to the book: “What I have learned over time, regardless of the industry or group, is that the pace of change that we have seen in the last few years is not going to slow down – the future does truly belong to those who are fast. The future doesn’t belong to those who have owned a market place because of their history. Past success doesn’t guarantee a future of winning. Resting on ones laurels is perhaps the best method to place yourself at the greatest risk in the future. We live in a world in which business models evolve at a furious pace. In which customers are demanding and expecting new forms of interaction. In which technology and mobile devices are changing industries at a furious pace. Everywhere you look, you witness rates of change and innovation which are accelerating, not slowing down. 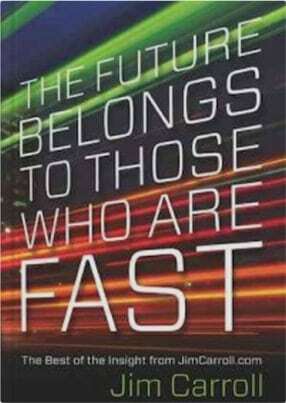 If you are trying to figure out how to deal with the faster world that surrounds you, then you need this book. Think about it: the high velocity global economy of today drives rapid consumer, business, industrial and marketplace change. The fast paced world around us is relentless and unforgiving. It drives increased customer and business partner expectations, requires faster innovation, and necessitates a faster more complex response to rapidly changing circumstances. That’s why you need to learn how to innovate when faster is the new fast – by getting into a mindset where you’re prepared to figure out a solution to a problem, almost before you know you have a problem. Activity: you’ll learn what you should start doing now to elevate the importance of your innovation efforts. 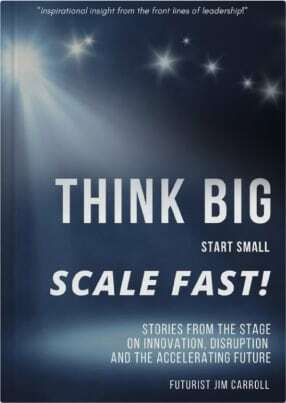 The book takes a look at the concept of innovation in a new, and well, innovative way, in that it helps you understand how to link your innovation efforts to the high velocity change that surrounds you. It examines the concept of agility: how organizations can ensure they structure themselves to take advantage of and respond to fast-changing circumstances. It builds upon that message, by examining some of the key innovation success strategies that you should be thinking about. Sprinkled throughout the book are various observations that I have made, of some of the innovative practices I’ve seen with various organizations, large and small. When you’ve been looking for innovative stories for close to a decade, you discover quite a bit of wonderful insight. The book will provide you the inspiration to adapt and change in order to keep up with high velocity change. It will also open up the minds of your staff as to the need for day to day transformation in what they do, how they do it, and why they do it. And it will frame the issue of innovation for you in a new and critical way. 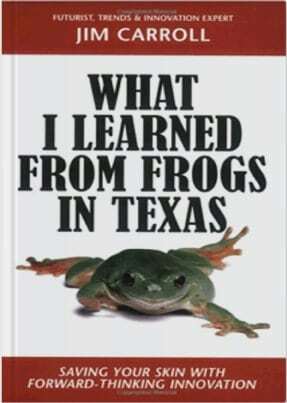 “If they don’t get off that road, there is going to be a big problem and it’s going to be ugly!” With that quirky observation of a group of frogs in Texas, Jim Carroll captures the essence of the challenges faced by organizations today. We live in an era of unprecedented and relentless change. The emergence of China as a superpower; hyper-innovation and business market turmoil; constant career change and rapid scientific advances. Competition is changing over-night, and product life cycles often last for just a few months. Permanence has been torn asunder. We are in a time that demands a new agility and flexibility: leaders must have the skill and insight to prepare for a future that is rushing at them faster than ever before. A Daily Inspiration Quote from Jim Carroll. "Motivational insight and trends observations to start your day"